A Fox Business article, In-Q-Tel: A Glimpse Inside the CIA’s Venture-Capital Arm, lists some of the companies and agencies that are involve. “Founded in 1999 as a way for the U.S. to keep up with the rapid innovation in science and technology, In-Q-Tel has been an early backer of start-ups later acquired by Google (GOOG), Oracle (ORCL), IBM (IBM) and Lockheed Martin (LMT). Their focus on Startups Backed By The CIA is still a prime objective. In keeping with the corporatocracy economy, government direct funding or indirect assistance has become the model for startups to chase. Whatever happened to the capitalist formula of raising money from private sector investors for an equity interest in a venture? The rules of the playfield seem to be very different when the end user and customer for the technology is some government agency. Examine the case experiences described in 25 Cutting Edge Firms Funded By The CIA. “It's no secret the Central Intelligence Agency has an investment firm that funds startups that could have a big impact for the Agency. If there is a company out there doing intelligence research, it's likely that, the CIA's personal investor, either looked them up or made a check out to them. It's all to ensure that the Agency remains on the forefront of tech. Not long ago, In-Q-Tel invested heavily in a company called Keyhole. Never heard of them? Maybe you know their work, a little project eventually known as Google Earth. Note the acknowledgement that the AGENCY maintains an investment stake in companies. Guess the keyhole into the world of high-tech dominance has a code to unlock the fruits of the applications, residing in Langley VA.
An important analysis of How the CIA made Google is a prime source of documentation. With the revelation of the role that the Highlands Forum has in the process of development, it would be important to research their activities. However, that proves difficult, since a login account is required, and no way of registering to access is available. So look at the info on the Highlands Group, for publically disclosed information on the organization. So what is the point of all these interwoven relationships? The underlying element that permeates these tech companies is that the federal government is systemically involved in the funding, purpose objectives, application acquisitions and equity participation. Is this the new normal for the economy? Looks like it is, but such an organizational structure does not conform to the standards of free enterprise. This method for invention does not have the identical importance as “The Manhattan Project”, but may well create advance technology that will have the same or greater risks of permanent extinction. Consider the long history in the quest for Developments in Artificial Intelligence. Mentioning DARPA and RAND Corporation in the same abstract gives pause to anyone familiar with the record of Dr. Strangelove projects. Lastly ponder the question of corporate control and independent management in the era of government funding. 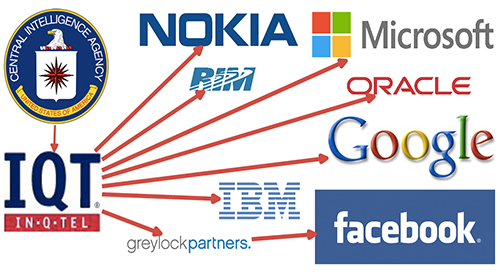 Is Google a real standalone company or is Facebook the social network department for the NSA? Is the wealth of Bill Gates, the equity positions of Larry Page and Sergey Brin, or the tax dodge shares of Mark Zuckerberg a true reflection of their actual ownership stakes in their respective companies; or are they mere fronts for a shadow government? Just how many Eric Schmidt types are embedded in high-tech pulling the strings for the intelligence community? The In-Q-Tel of this world act as the JP Morgan’s of the twenty-first century. Nikola Tesla’s free electricity wireless distribution was killed by the robber baron. Today the role of inventive genius is managed and contained by technocrats following the directions of spooks, who do the bidding of the supra elite. Some intriguing questions for a Congressional hearing start with just how much money was ‘invested’ and how large of a return did the government get out of these startups? End with what were the sums of money these firms spent on lobbyists? Surely, inquiring minds would like to know.